All parents damage their children. It cannot be helped. Youth, like pristine glass, absorbs the prints of the handler. Some parents smudge, others crack, a few shatter childhoods completely into jagged little pieces beyond repair. A sort of Philip Larkin for the neglected child. But a fitting quote that begins Lisa’s own fucked-up-ness childhood into care leaver story. Lisa had a ‘burning desire’ to write a book and began her writing journey through blogging, something she loved to do. Something that became part of a cathartic healing process. For a long time I have felt that I had many stories to tell: stories that would heal the wounds left over from years of therapeutic intervention, 12 step programmes and self help books galore. Once started on her life story, Lisa writes for herself all too aware that her private, innermost thoughts once published become the property of others. She believes by telling her story it is not just herself that will benefit. And when we stand up and stand out and share our story, we open up the possibility of helping another person heal too. The book is split into two parts, the first, is Lisa’s own experiences. Each chapter begins with the time it is set and ends with a page dedicated to the soundtrack of her life, popular songs, the headlines in the newspapers, what she watched on television and a page of remembered moments. As I ran up to the house from the car that dropped me off I used the palm of my hand to push the door open as I thought it was just pulled too, but it was locked shut and my hand went straight through the glass. So it’s 1969, and as I understand it, my mother had been ‘dating’ someone for a few months, maybe three. His name has always been a mystery but Dave and Fred have been mentioned on the various occasions that I have tried to have a conversation about who this mystery person – my father – may be. For children who end up in care there is always the before and after story. Even if they were a baby before being handed over for fostering, adoption or residential care, there is the mother’s life before the pregnancy and birth and possibly time with each other. There is what happened to the child before they went into care and what happened whilst in care and what happened when they left the system. We are the carriers of the quiet stories, the silent ones, the versions of life that are often untold. I wanted my voice to be heard – and I wanted to provide a space for the voices of others too. Interspersed between the narrative are references to policy makers and the statistics and data that measure care leaver outcomes. What is missing is how it ‘feels’ to be a child in care – and how those feelings continue to affect children long into adulthood. The second half of the book is a collection of brief anecdotes written by care experienced adults who in many cases are failed or even physically, morally, and sexually abused by the corporate parents supposed to protect them. In spite of this most go on to have a successful, fulfilled though obviously care-affected life. Lisa wrote her dissertation on care leavers: how the system actively prevents the creation of support networks for young people entering into adult life and how this impacts upon them and their feelings of isolation. This is not a sensationalist piece of work designed to satisfy the hunger for trauma and drama that may reside in some. It’s a book that will inform social work and education. Precisely because it is so much more than a ‘care leaver’ story – that is not to undervalue those other narratives. It’s written with an intelligence and awareness that illustrates the struggle of what it means to heal the past, to survive, despite a too often familiar story of neglect in a system that is supposed to protect and care for neglected, abused or traumatised children. 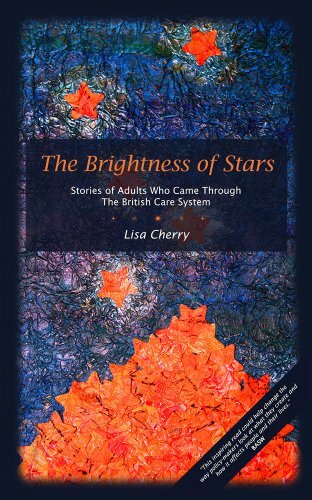 The Brightness of Stars candidly explores Lisa’s own experiences and enables others to reflect on theirs in a book which focuses on the adult voices of those who have experienced the care system. Through the personal insights and reflections of those who were once a looked after child, these often unheard stories are brought vividly to life. These are stories about love and pain; hurt and isolation; the depth of lived experience that makes up a life; the big things and the little things; how we live our lives through our relationships with others; and where we feel we fit in. Through these stories we can provide some thought-provoking information and recommendations for all those who work directly with young people. This entry was posted in Blog, Care Leavers, Reviews and tagged Care Leavers, Foster care, residential care. Bookmark the permalink. Reblogged this on Care Givers Count.